Fall is here in full swing and it is one of our favorite times of the year! With autumn comes the beautiful red, yellow and orange hues of the changing leaves, pumpkins galore, football and a crisp chill in the air! What could be better? Today we wanted to show some awesome fall photography that showcase just how gorgeous this season truly is and how you can take any type of photo session and incorporate the beauty of fall! Whether you are shooting fall engagement photos, a beautiful fall wedding, young children playing in the pumpkin patch during a family photo session, or simply just love to capture beautiful landscapes with vibrant colors, fall is the perfect time for snapping some photos. So, sit back, sip on that pumpkin spiced beverage of choice and enjoy these beautiful fall photos. Do you love these leaves in this wedding photo above? Here are some awesome Leaf Overlays by Jamie Dalton Photography that are perfect for your fall portraits! Get them here for just $29.99 (and save $220!). Do you use Lightroom and are so excited about the BP4U Fall Action Pack? Look no further! You can download it here for only $49.99 (vs. $179.99) and get 27 presets you can use to edit your photos. 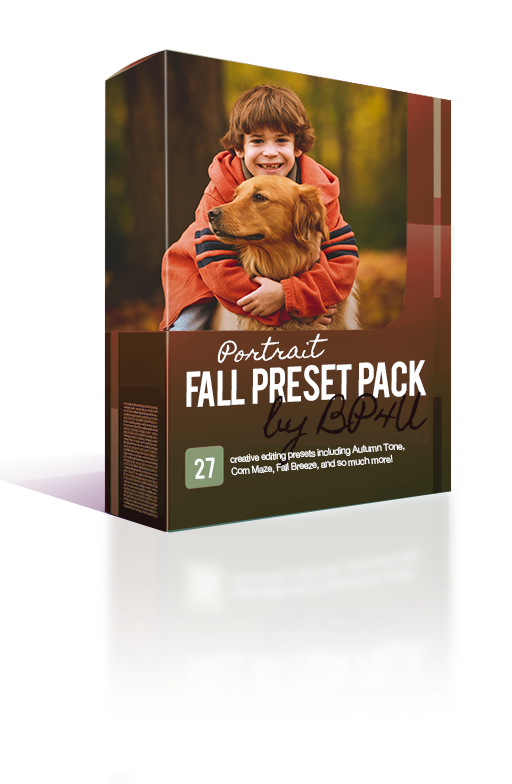 Click here to order the BP4U Portrait Fall Preset Pack here!